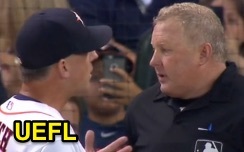 HP Umpire Bill Miller ejected Astros Manager AJ Hinch for arguing a Replay Review decision that overturned 3B Umpire Adrian Johnson's out (catch) call in the top of the 5th inning of the Tigers-Astros game. With two out and one on, Tigers batter Ian Kindler hit a 2-1 cutter from Astros pitcher Collin McHugh on a line drive to left field, where left fielder Preston Tucker attempted to catch the ball. Upon Replay Review as the result of a challenge by Tigers Manager Brad Ausmus, Johnson's ruling was overturned and baserunner R2 Anthony Gose was awarded home plate, the call was irrecusable. At the time of the ejection, the Tigers were leading, 1-0. The Tigers ultimately won the contest, 4-2, in 11 innings. This is Bill Miller (26)'s first ejection of 2015. Bill Miller now has 2 points in the UEFL Standings (2 Previous + 2 MLB + 0 Irrecusable-Crewmate = 4). Crew Chief Bill Miller now has 3 points in Crew Division (8 Previous + 1 Irrecusable Call = 9). This is the 157th ejection of the 2015 MLB Regular Season. This is the 73rd Manager ejection of 2015. This is the Astros' 5th ejection of 2015, T-1st in the AL West (HOU, SEA 5; LAA, OAK, TEX 3). This is AJ Hinch's 2nd ejection of 2015, 1st since June 20 (Mike DiMuro; QOC = U [Replay Review]). This is Bill Miller's first ejection since May 6, 2015 (Walt Weiss; QOC = Y [Balls/Strikes]).